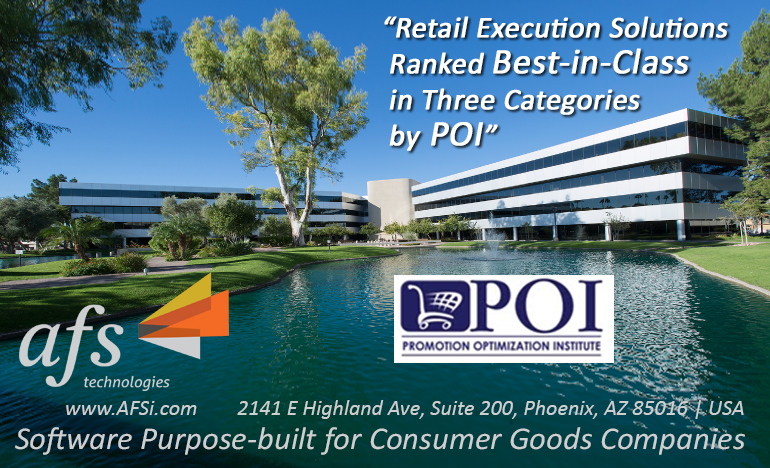 Phoenix, Ariz – Mar 28, 2018 – AFS Technologies, a leading global provider of software solutions purpose-built for consumer goods companies, is proud to announce its Retail Execution solutions have been ranked Best-in-Class for Guided Selling, Merchandising and Analytical Insights categories by the Promotion Optimization Institute (POI) in their recently released Vendor Panorama for Retail Execution and Monitoring in Consumer Goods for 2018. The continued growth of AFS’ global customer base is a result of the functional breadth and depth of its two retail execution offerings, designed to scale and fit varying market and organizational requirements. The flagship solution, AFS RE Enterprise reflects best practices from deployments in many of the largest global CG organizations, and POP System 6, a nimble, flexible, multitenant SaaS solution that can be deployed in a matter of days. Also highlighted in the report is the strength of the AFS relationship with Microsoft across development, technology and platform, services, and software solutions, unique in the Retail Execution solution category. AFS is also one of only five providers that can boast global deployments. The Vendor Panorama for Retail Execution and Monitoring from POI provides key insights for sales, marketing and merchandising executives and identifies best-in-class across categories such as user experience, merchandising, guided selling, analytics, product vision, and configurability. In the 2018 report now available, we are once again pleased to offer this analysis of the global Retail Execution marketplace. Over 23 solutions from 21 vendors were evaluated, with best-in-class capabilities highlighted along with recommendations to help improve business outcomes at retail. The full report from POI can be accessed here.